Founded more than 100 years ago, STRONG is specializing in manufacturing of a full range of digital, terrestrial, satellite, cable and IPTV equipment and accessories. In Europe, the brand entered in 1989 with sales office in the UK and very quickly managed to become one of the leading suppliers and distributors of receivers and equipment for television, thanks to its rich experience and know-how. The company puts a strong emphasis on design and quality by working with highly qualified R&D team, localized in Europe. Today, the company has 9 operating subsidiaries and 6 regional sales offices that cover the market in 55 countries around the world. STRONG focus on the specific needs of the client and as a manufacturer and a worldwide distributor of digital devices and related peripherals, STRONG recognizes that its activities, products and services could have an impact on the environment. To reduce this, they are dedicated to saving energy associated with the production of safety equipment products and implement programs for all of our key wastes for recycling. STRONG guarantees innovation, reliability and high quality as well as environmentally-friendly products. VIKIWAT Ltd. is a wholesaler and retailer of a wide range of Strong product catalog. In our offline and online stores you can easily find and buy DVB-T / T2 outdoor antenna with amplifier, active outdoor DVB-T antenna, digital terrestrial HD TV receivers, remote controls for digital decoder Strong and many other accessories at affordable prices with quick delivery. Wireless router STRONG, 300Mbit/s STRONG Wi-Fi Router 300 creates a high-speed secure and stable Wi-Fi network for everyday web activities. The two adjustable external antennas will provide broad, reliable and secure Wi-Fi coverage in your home. Dual band router 750 Mbit / s STRONG The dual band router STRONG 750 is a compact, extremely fast, intuitive interface that turns your home network into a sea of enjoyable experiences on the global network. 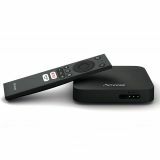 Its incredibly fast speed allows you to instantly transfer audio, video and all kinds of information between your devices. Satellite antenna with integrated single LNB, SlimSat SA61 Innovative satellite dish with integrated Single LNB for connection of one satellite receiver. It can rapidly and easily be installed. SlimSat is portable. Dual band gigabit router 1200 Mbit / s STRONG The dual-band gigabit router STRONG 1200 is compact, extremely fast and with an intuitive interface. Its incredibly fast speed allows instantaneous transmission of audio, video and any kind of information between your devices. Your personal information is secured with the highest level of protection. LED TV LED, 24in, HD READY 1366 X 768, SRT 24HZ4003N The STRONG Z400N Series LED TV offers clear picture and realistic sound. This TV series features an elegant design and is also equipped with a triple tuner and a CI + slot. The Multimedia feature lets you play your favorite music, photos and videos on your TV screen. Satellite antenna with integrated Twin LNB, SlimSat SA62 Innovative satellite dish with integrated Twin LNB for connection of two satellite receivers. Easy installation. SlimSat is portable. LED 32 "HDTV, HD 1366x768, STRONG, Z400N series, 80cm, SRT 32HZ4003N This TV reflects the benefits of small TVs and is ideal for places where you do not have much space or as a second TV - whether it's for the bedroom, nursery, work room or kitchen. The TV has a built-in DVB-T2 / C / S2 tuner and 12 V power supply is suitable for mobile use in caravans, boats or campsites. LED TELEVISION 39 ", HD 1366X768, STRONG, X100 SERIES, 99CM, SRT 39FX1003 The Strong Series X100 series is a new start in LED TV technology. Clear high resolution images, easy menu control and LED TV functions. This Strong model offers the sharpness and smoothness of the moving objects. At a great price. LED TV 40 ", HD 1920X1080, STRONG, X400 SERIES, 101CM, SRT 40FX4003 The Strong X400 series of TVs is a new beginning in LED TV technology. Clear high resolution images, easy menu control and LED TV functions. This Strong model offers the sharpness and smoothness of the moving objects. At a great price. WiFi Range Extender, Router, Access Point Universal repeater 300Mbps Wi-Fi, Strong Strong Universal Repeater 300 is the ideal solution to give your WiFi coverage a boost. At a maximum speed of 300 Mbit / s, it's a unique compact product that can be also configured as a Router or an Access point. Universal WiFi Range Extender, Router, Hot Point 750 Mbps, Strong The Strong dual band repeater 750 is the perfect solution for expanding your wireless network. The maximum speed of 750 Mbit / s, and the ability to run both a router and an Access Point, makes it a unique product at a great price. Powerline Adapter Kit 1200Mbit/s, STRONG Powerline 1200 KIT from Strong is easy and quick solution to get a high-speed internet connection (up to 1200 Mbit/s). Use your existing electrical wiring and extend your Internet access quickly. Just plug into a electrical socket and connect your computer, game consoles, smart TVs or any other network-compatible devices at your home. USB WiFi adapter STRONG 600 STRONG USB Wifi Adapter 600 powerful and compact wifi adapter for you computer and laptop.